"Blood Is My Trademark" is album number two for German act Blood God. And Blood God is a side-project from Debauchery's Thomas Gurrath. For those who do not know the name (or at least this version of Debauchery!) Tomas' main band (musically-speaking) is a mash-up of death metal and hard rock. Here with Blood God the name of the game is hard rock/heavy metal with vocals that could best be described as coming from the Destruction/Kreator/Sodom school of thought. Influences included the likes of Judas Priest, Accept, Iron Maiden, Motörhead and AC/DC and for what this band* is shooting for it's solid enough if nothing to get overly excited about. 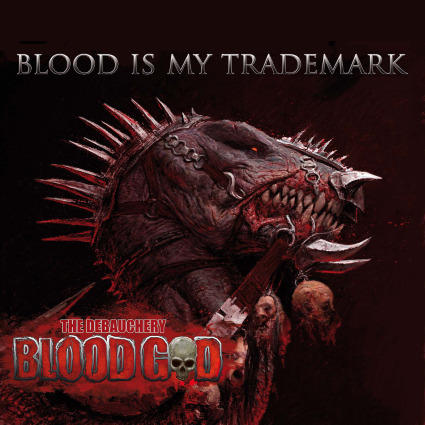 Interesting enough the the limited edition digipak of "Blood Is My Trademark" comes with a bonus CD that swaps out the German thrash-style vocals with a "monster voice". All of which makes the second disc just sound more like Debauchery! The thing is Blood God is rumored to simply be a solo/one man project of Thomas Gurrath. Whatever the case I actually prefer Blood God to Debauchery as Blood God is not as cheesy and (for what it is and all) it's actually pretty "rocking" in a "Motörhead will always be the true God of rock and roll so let's worship at it's alter and keep the guitars slamming for as long as possible!" kind of way!